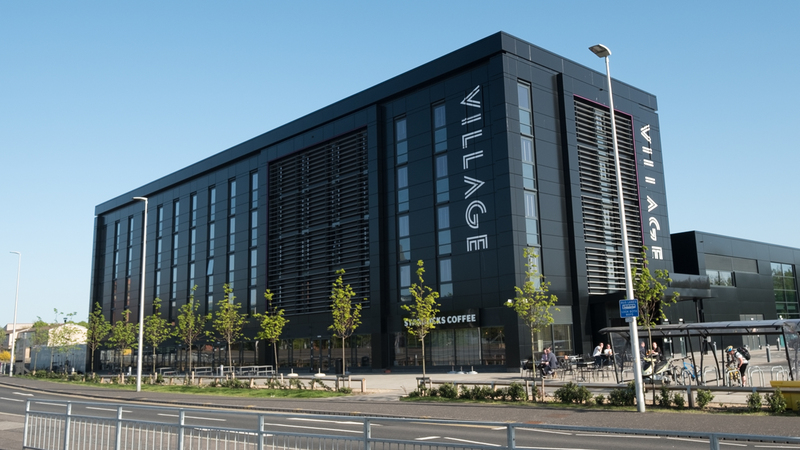 This urban village resort hotel and leisure complex for De Vere, is located in the former site of the Glasgow garden festival, an infilled basin of the historic Queens Dock on the south side of the River Clyde, perfectly located within walking distance of the Glasgow Science Centre and SECC. The design proposals involved the design of a 5 storey steelwork frame with concrete metal deck floors for the 110 bed accommodation, with conference and dining facilities located at ground floor. Clever spatial planning of the ground floor enabled the omission of transfer structure, which is such a common feature of hotel design, whereby steelwork elements were expressed as the interior design rather than hidden from view. The building is positioned parallel to Pacific Drive, created retaining walls alongside the newly constructed ‘fastlink’ which provided a convenient sheltered external courtyard for casual dining. The building has a large 2 storey leisure wing linked to the hotel with bridging structures, at first floor, accessing the gym and pool facilities. The pool structure and leisure building were constructed directly over the historic quay walls, where the substructure was designed to span over these buried structures, with the precast piles co-ordinated between the wall anchor ties. Predicted flooding dictated the building floor level with the access route from Pacific Drive to the front entrance of the building being maintained, for the safe passage of emergency vehicles, in periods of an extreme flood event. Sustainable urban drainage systems were adopted for the building and car park run – off, prior to discharge via a newly constructed pumping station on Pacific Drive to the River Clyde.